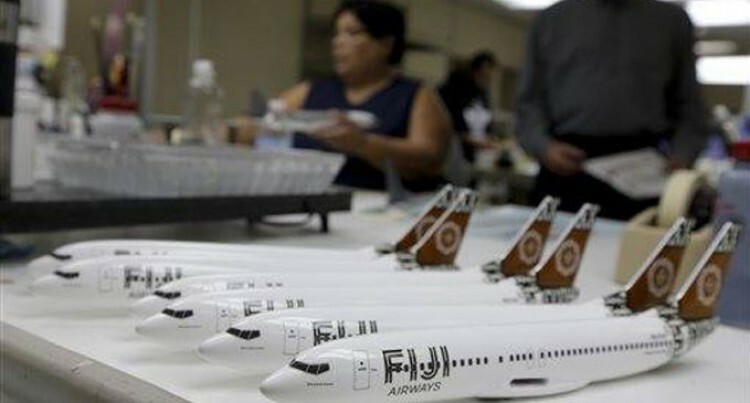 Fiji Airways model planes are lined up awaiting completion at Pacific Miniatures in Fullerton, Calif. When airlines open new routes, make deals with other carriers or finance new jets, there is a gifting of high-quality models. They are used to break the ice at difficult meetings, are tremendous marketing tools and a favored way of saying thank you. While a business card might be quickly stuffed away in some desk drawer, models remain prominently displayed on the desk of politicians and industry power brokers. Puerto Rico’s governor, Alejandro GarcÃ­a-Padilla, has models from JetBlue, Lufthansa, Avianca and local airline Seaborne in his office. Each has established or expanded service to the island since his 2013 inauguration. “It’s one of these gifts that people get and don’t put in the closet,” says Jeff Knittel, who oversees aircraft leasing for financier CIT Group Inc.
European aircraft manufacturer Airbus took in 1,456 passenger plane orders from 67 airlines around the world last year. It also placed 30,000 of its own orders – for model Airbus jets. The tradition of exchanging model planes has been around for decades. Walk through the headquarters of any airline and rows of models – including those of competitors – can be spotted. Gerry Laderman, senior vice president of finance and procurement at United Airlines has collected his fair share after 30 years in the business. There’s no room left in his Chicago office, so new acquisitions are displayed on the hallway windowsill. “They were tasked with promoting the romance and luxury of air travel,” says Fred Ouweleen, Jr., current owner of the company affectionately known as PacMin. The company, based in Fullerton, California, created large cutaway models that showed aircraft interiors to a public that had – for the most part – never stepped foot on a plane. Those models would become a mainstay of travel agencies for decades. Soon there was demand for smaller models that could fit on people’s desks and bookshelves. Today it is those models, scaled to one hundredth of the size of a jet, that PacMin is best known for. “Still, more than 15,000 models are sold a year ranging in price from $130 to $1,500 each, depending on the size, speed and difficulty of the order. Privately-held PacMin employs 165 people and sees $10 million in annual sales. Members of the public generally can’t buy PacMin models, although plenty end up on eBay, with sellers generally asking $200 to $400. Jung, a former airline worker, now processes badges at Milwaukee, Wisconsin’s main airport. Every employee – those who work in stores, restaurants or for the airlines – must pass through his office to get their credentials.